As we look into 2018 and the challenges it may or may not bring, I cannot forget the emotional highs and lows that came to the Bridlington Lifeboat Station in 2017. 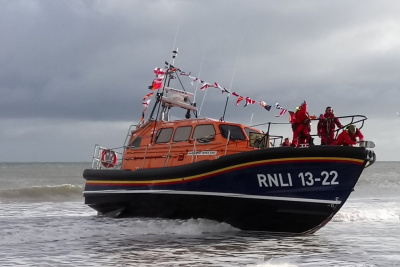 Sunday 12th November was a memorable occasion when the new Shannon Class Lifeboat the Antony Patrick Jones arrived in Bridlington and was gently nursed into its brand new Boathouse on the Princess Parade Promenade. The arrival was the final part of the jigsaw which brings about a significant new chapter in the history of the Bridlington Station. But as one day dawns another day closes and on the 10th December the Mersey Class Lifeboat the Marine Engineer which has served the Station exceptionally well for over twenty years left the old boathouse on South Marine Drive for the last time for pastures new. The contrast between the two occasions was very telling. This has left the old boathouse on South Marine Drive empty in the sense of no Lifeboat but still full of past memories. It was 1903 when the property was converted to house Bridlington Lifeboats which at the time was a simple boat propelled by strong men and oars with the occasional help of a sail. One of those oars has been retained as a reminder. Since then the old boathouse has witnessed incredible changes in the way Lifeboats have progressed and witnessed the continued bravery and heroism of the people that man the lifeboats in the undoubted calling to Saving Lives at Sea. The Antony Patrick Jones is light years ahead of the Marine Engineer and if the Lifeboat men of 1903 were able to come back and see the modern day lifeboat with all its sophisticated equipment and stunning ability to meet any conditions thrown at them by the sea and weather conditions to be amazed would be a gross understatement. But one thing that has not changed is the heroism and bravery that all life boatmen bring to the service whether it be 1903 or 2018. Equally so is the respect and support that the town of Bridlington and the wider area that continue to give to the Lifeboat Service which was evident on the arrival and departure of the two lifeboats; with that support the crews know that they can go to sea with the very best of equipment. So when I look to 2018 the most significant challenge is to meet, accept and embrace change; the new lifeboat demands a fresh approach to how it operates as the RNLI strives to improve its Search and Rescue facility. This is no different to all our lives; to resist necessary and progressive change can be a retrograde step and benefits nobody. With a brand new boathouse and a brand new boat funded in the main by the Bridlington Community it will serve the town for many years to come and we at the Station acknowledge and appreciate the support we receive from the local community. But above all the greatest challenge in 2018 and beyond is to ensure that our Lifeboats and crew always return to shore safe and sound.